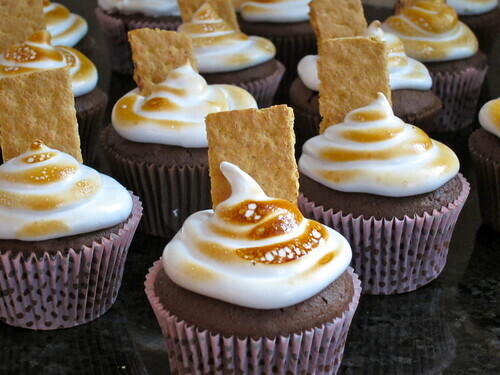 Modifications: I used a Betty Crocker Triple Chocolate Fudge Cake Mix for the cupcakes. 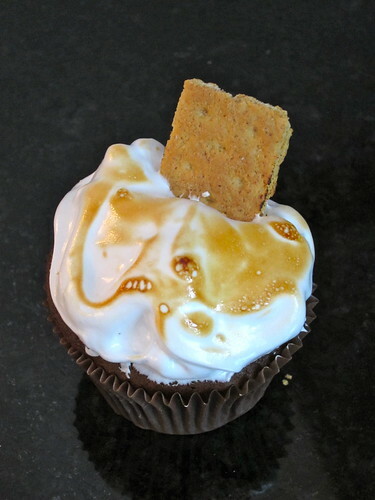 The recipe originally calls for homemade graham flour based cupcakes but who has the time or $$$ to look for graham flour from a specialty store?? (Even though I *heart* Martha she is so impractical at times) The original cupcake is then suppose to be topped with a ganache and homemade marshmallow frosting. I omitted the ganache (I think Triple Chocolate Fudge is enough), but I did make the homemade marshmallow frosting. It's basically a gelatin based marshmallow recipe (make sure to add 1+ tsp of vanilla) that you QUICKLY pipe onto the cupcake before it starts to set-up (easier said than done). It's a pretty messy process, but totally worth it. After applying the frosting I stuck in a graham cracker stick and used my trusty kitchen blow torch for the browning. 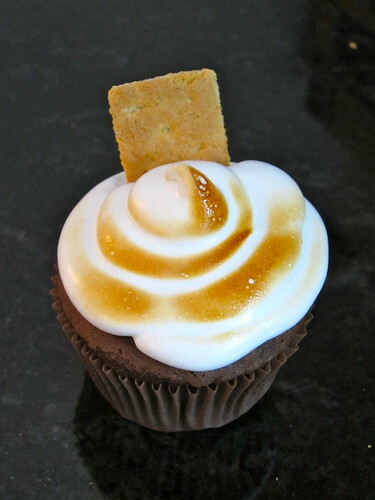 Caution: If you ever use the blow torch on a cupcake - turn the flame WAY low and use a sweeping motion from the top of the cupcake - not at a horizontal angle - or you will catch the cupcake liner on fire. I'm not kidding here . . .
Joan - as you can see, I shared them with a few friends on Sunday (Porter called them sticky, sticky, sticky). I'm hoping to have something even better for May! Leighann - you go girl! You need to put some meat on those bones. You have got my attention...I'm intrigued! YUM!!!!!!!!!!!!!!!!!!!!!!!!!!!!!!!!! I wish I had made those but you made them so perfectly, I think mine would only be inferior. Oh my gosh I want to eat these!